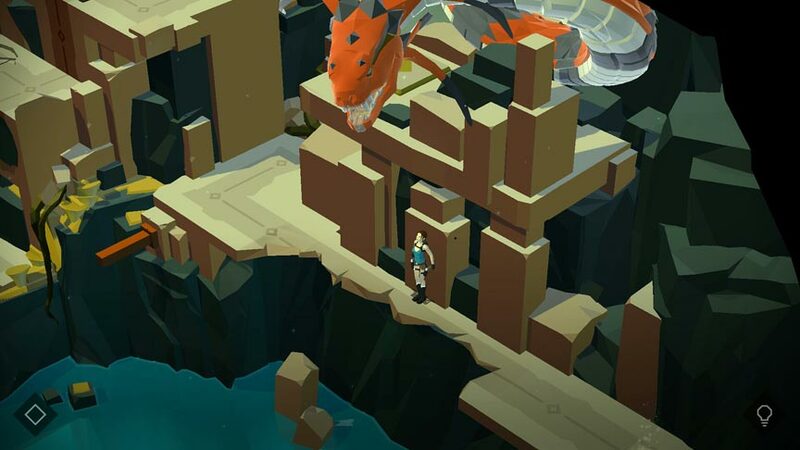 Square-Enix Montreal has followed up their tremendous digital boardgame Hitman GO with Lara Croft GO in the same vein of game distillation. 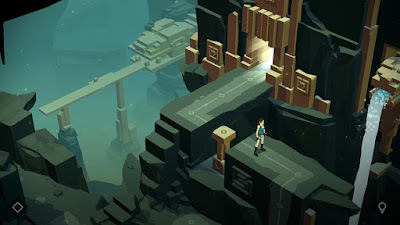 They've taken the Tomb Raider franchise and boiled it down to a turn-based puzzle game done in a beautifully rendered art style. Visually, the game presents the 2 dimensional play with a nice depth of field by using darkened foregrounds, and washed out backgrounds, making the areas feel like the vast caverns and lands you are exploring in search of the "Atlas of Beyond." The graphics are clean and fluid and are suited nicely to rendering the atmosphere of the world around Lara. There's even occasional additional touches for players to see such as every once in a while Lara will do a hand-stand when climbing atop something. It's a small detail that adds a lot of character. Instead of the typical run-in-and-kill-everything-that-moves-with-dual-pistols traditionally associated with Tomb Raider, Lara now must rely upon environmental manipulation and strategy to get around and kill enemies. Players can shoot enemies from the side or behind, lure them onto crumbling pits, spear them, trigger a dart trap, or pull a lever to drop a boulder on them. The main level puzzles themselves are very well done. They're set at a nice and gradual difficulty growth, never reaching the frustration levels of the final ones of Hitman GO, which is a good thing. There's just enough challenge, but nothing ever truly hair-pullingly arduous, skirting a line of perfect balance in its progression. Each new puzzle element like a movable column is added, it becomes one extra step you can utilize on the path to the goal. True to the Tomb Raider franchise they've also included collectibles in the form of urns to find scattered through the levels. The urns contain parts of a set of various jewelry or other gems and relics. Initially they are easy to spot and become harder to find later on. The only real issue with this is that some of them are in a blacked out section of the screen and I only found them by randomly tapping the darkness. Others are far off in the background, blending into it, and a few are primarily hidden around corners where only a small piece of the urn is visible. The benefit of collecting them for the 100% is that they unlock extra costumes for a little replayable fun. Lara Croft GO is a wonderful example of game reductionism. They took a great IP and made something amazing out of it. Simple controls, a brilliant art style, great music, all wrapped up with a fitting adventure story. This was much shorter and easier than Hitman GO (that isn't a complaint, I actually appreciate the brevity here) so I wonder if they will add any extra levels or DLC packs at a later date. I really hope Square-Enix Montreal keeps up with this trend, possibly exploring other S.E. properties like Deus Ex, Thief, or even a new take on Murdered: Soul Suspect might be worth attempting with the GO franchise's new formula.